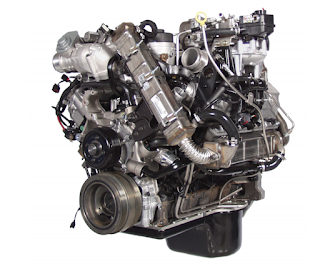 After a successful run with the 7.3L Power Stroke (which was discontinued due to rising emission standards rather than performance issues), Ford again sourced International to build their diesel powerplant for pickups and vans. The 6.0L Power Stroke, first released in 2003 model-year vehicles, was notable in that it featured a variable geometry turbocharger, the first Ford had offered. Most of us know what happened: inherent problems with the 6.0L (we call them 'pattern failures') caused the engine to become notorious for constant headaches. 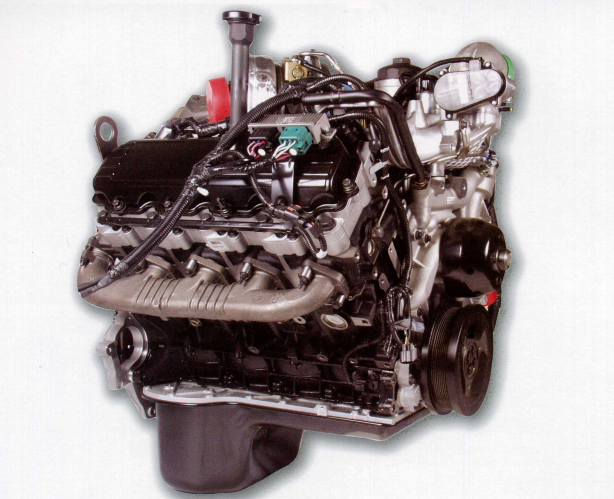 In 2007, Ford released the 6.4L Power Stoke, with hopes that the headaches would fade, but all-too-common problems often crippled the engine's reputation. Bullet Proof Diesel was the first to offer fixes for these pattern failures, and today reliability can be achieved in either engine. The coolant paths are different. 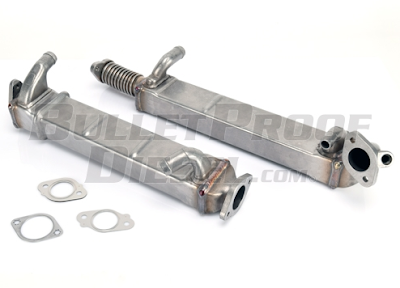 Often, a failed EGR cooler in the 6.0L stemmed from a clogged-up oil cooler, which wouldn't let coolant flow into the EGR cooler. The 6.4L has separate coolant passages for the oil cooler and the EGR cooler. The oil coolers are different...kinda. We mentioned plugged-up oil coolers in the 6.0L above; Ford responded to this problem by adding an extra coolant layer in the stacked-plate oil cooler. It was an imperfect fix, as oil coolers in 6.4L's still regularly become clogged with coolant debris. The 6.4L has two EGR coolers. One horizontal, one vertical. A lack of coolant can cause either one to rupture. The 6.0L has one EGR cooler. The 6.4L has two turbochargers (one 'low' pressure and one 'high' pressure). When the engine was released, it was the first light truck diesel to feature more than one turbo. The 6.4L uses a Diesel Particulate Filter (DPF). The 6.0L pre-dates Ford's use of DPF. Other differences are more obvious; the larger displacement of the 6.4L helps it to create a bit more power than the 6.0L ever did. The 6.4L is rated at 350 horsepower and 650 ft/lbs of torque compared to the 325hp/570ft/lbs made by the 6.0L. The 6.0L was produced for five model-years, 2003 to 2007. The 6.4L was produced for just three, from 2008 to 2010. As such, 6.0L parts and components seem to be a bit more readily available and at better prices. Perhaps the smaller number of 6.4L-powered trucks on the road is the cause of this disparity.